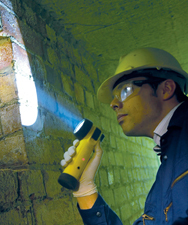 THE WOLF ATEX LED TORCH IS AN ATEX AND IECEX CERTIFIED PRIMARY CELL LED RIGHT ANGLE SAFETY TORCH, USING THE LATEST TECHNOLOGY TO GIVE EXCELLENT PERFORMANCE, ROBUSTNESS AND RELIABILITY FOR SAFE USE IN ZONES 1 AND 2 POTENTIALLY EXPLOSIVE GAS AND ZONES 21 AND 22 DUST ATMOSPHERES (TR-40/TR-40+). A ZONE 0 AND ZONE 20 VERSION IS AVAILABLE (TR-45). ALL GROUP I APPROVED FOR USE IN MINING APPLICATIONS. Its unique optics deliver a piercing beam of outstanding light, combined with a lower level flood of fringe light, from a high power ‘fitted for life’ LED giving a peak of up to 192 lumens light output. Four AA/LR6 primary alkaline cells fitted in a cassette provide a light duration at full brightness of up to 6 hours and thereafter a low level light for many hours. The TR-40+ model has a low battery power indicator allowing a user to monitor the state of battery charge as it diminishes, a red flashing light is emitted through the side of the torch body while battery power and light output is high, but switching to continuous red when battery and light output is low, warning battery replacement is required.